On Sunday I went for another huneliggers ride. At the start there were ten velomobiles, and my bike which looks rather exposed by comparison. The photo shows when I'd stopped everyone due to getting a puncture. A new back tyre is in order as that fitted now seems a bit thin. We meet half way between Assen and Groningen, but this week we rode southwards past Assen again. The result is that my ride was just 85 km while others had done 135 km by the time they got home. A previous outing with the huneliggers was described earlier. If you want to see velomobiles going considerably faster than I can manage see the footage here and here. We organise cycling holidays in this area. Recumbent cyclists are most welcome, as indeed are any other kind of cyclist. I really want to try one of these! They look like fun! Can you load them like kayaks? I notice several are wearing helmets. Is that for safety, or to cut down wind resistance? They do look pretty cool. Are they common in the NL? "DUTCH CYCLISTS WEARING HELMETS SHOCKER"
Yes, several do wear them for these rides. You find that while no-one wears a helmet for going to the shops here, virtually everyone riding an upright racing bike in replica team strip does wear a (matching) helmet. It's a cultural thing. Helmets are not political here because no-one at all is trying to force anyone to wear one. On this ride, speeds were low enough that wind resistance wasn't really an issue (unlike at the two links at the end of the article). Are they common ? That's difficult to say. They're much more common than anywhere else, but rather less common than traditional town bikes. Adrienne, there is loads of space behind the seat for luggage. That would indeed be a fun headline. I've long known the Dutch don't wear helmets, which was why I was suprised that someone riding a three-wheeled bike would wear one. While I was on a ride along the banks of the Maas recently one of those came past me at the speed of light! Boy, do they go! Also, they make a strange rumbling noise as they close in on you - the bodywork acting as a sounding box, amplifying the tyre noise, I guess. Very eerie if you're not expecting it, as I wasn't. I'm one of the featured Huneliggers. Why do some of us wear helmets.... well, apart from the safety that a helmet may or may not give (and given the controversy, I really don't want to go into that any deeper) in a velomobile the head is the only bodypart exposed to the weather. In the summer it's cooler and in the winter, combined with a thin helmet cap or cover, it's warmer. When it rains the helmet keeps my head dry and I combine it with a cap to keep raindrops as much as possible away from my glasses. When the sun shines the same cap keeps my eyes in the shade, works better than sun glasses. Of course there are other head covering garments that can do the same but the helmet is one of the few that doesn't fly off when I'm doing 50km/h. Last but not least, a helmet is a requirement for the races of the NVHPV. My helmet is the smallest, toughest and lightest that I could find. Most helmets are too big and heavy. But please do not concentrate on the helmet, you can ride with the Huneliggers every sunday, with or without it. @Adrienne, come to the "Ligfietsgarage Groningen" if you want to try one ( I work there) Enough luggage capacity for fully loaded touring, these are very practical bikes. Harry, thanks for answering the helmet question. I have never ridden a Huneliggers, but they look like amazing fun and leave me with a couple of questions. How fast are they and how do they handle in the wind? 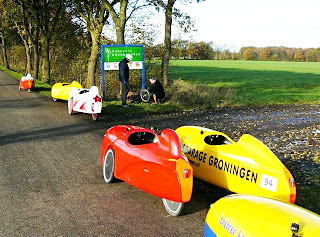 Bob, the recumbent trikes in the video and photos are called velomobiles. There are two types ridden by members of the huneliggers (the name of the local recumbent cycling group), the Quest and the Mango. And how fast ? Look at the last two links in the article.